Artwork: Artwork by Erik Wilson, Paul Kidby, Michael Whelan, Keith Parkinson and Darrell K. Sweet. Design by Susan Hood. Robert Jordan contributes "New Spring," the story of Lan's meeting with Moiraine and the beginning of her quest to find Rand. The story runs from pages 631-715. 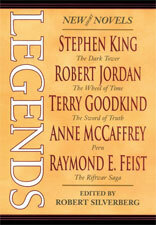 Click on the book cover on the right to visit Tor Book's web site on the Legends anthology. For the paperback edition of Legends, the book was split into three parts, with Jordan's work contained in the third volume. In January 0f 2004 New Spring: The Novel was released. This standalone book expands on the original short story, and is the first of three planned prequel novels.